KFA researches, preserves and promotes the rock art of the Kimberley. 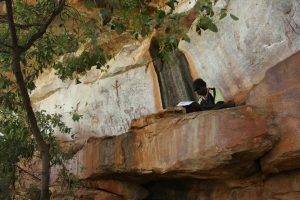 We fund research and we also initiate research centred on Kimberley rock art. We support a broad range of scientists from the fields of archaeology, geology, palynology and related areas who work with Aboriginal communities to uncover Australia’s earliest settlement history. Because Kimberley rock art is one the largest figurative bodies of art to survive anywhere on the planet…. and yet little is known about it. Because the story of Australia’s earliest settlement history should be known. Because Kimberley rock art may be as old as, or older, than the rock art found in the caves of Spain and France, examples of which are considered to be the world’s oldest representation of human artistic expression and culture. To encourage new young scientists into these fields of research. Australia's best kept secrets lie buried in the magnificent Kimberley. Thank you Kimberley Foundation for your tireless work to unlock the secrets of these ancient rock art galleries through your support for scientific research, and to share them with the rest of the world.